Poster for the film's re-release. 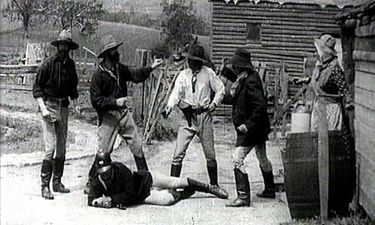 The Story of the Kelly Gang is an Australian silent film released in 1906, which is often considered as the world's first feature film. At around an hour long, it was also one of the longest films at the time of its release. Despite the titles the film clutched, as well as being a huge success, it became lost, with around 20 minutes of footage known to survive today. The film centers on Ned Kelly, who was one of the last bushrangers, a convicted murderer, and the leader of the Kelly Gang ("bushranger" refers to armed robbers in Australia during the mid-late 1800’s – think American old western outlaw archetype). The story goes through the gang evading police, holding up businesses, and committing murders, culminating in their “last stand” against police, which results in Ned Kelly’s and several gang members’ deaths. Ned Kelly’s death in the film differs from his actual death (he was tried and hanged for his crimes), but it is unclear how historically accurate the rest of the film was. A program containing a scene by scene narrative was available for audiences, which has survived and helped film historians make sense of the footage discovered over the years. 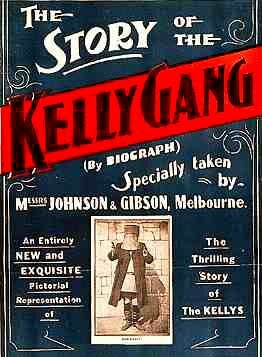 The Story of the Kelly Gang was produced by the prominent Tait family, who were involved in film and theater productions, and roles both behind the scenes and on-screen were filled by various family members. Production took approximately six months and a budget of £1,000. The filmmakers also managed to borrow a suit of armor used by the Kelly gang itself. Upon release, the film was an enormous hit. Descriptions of the early screenings indicated that a lecturer would explain live what was going on, in lieu of intertitles, and sound effects and dialogue were also performed live. After running for weeks in its premiere city, Melbourne, it toured the rest of Australia. Investors alone received £25,000 in return. The film’s loss can be blamed on factors similar to most every other lost silent film from this era; namely, the film was produced on silver nitrate (which deteriorates quickly and is very flammable) and those making the film did not realize how much of an impact film as a medium would have in the years to come. Between the end of World War II and the mid-1970’s, all that was left of the film was its program and some stills, as well as some reviews from when it was released. In both 1976 and 1978, a few small fragments were discovered in film collections and identified as part of The Story of the Kelly Gang using the surviving stills. In 1980, more footage was uncovered in a landfill in Melbourne and was then donated anonymously to the National Film and Sound Archive of Australia. In 2006, a seven-minute scene, the longest sequence discovered thus far, was found at the National Film and Television Archive of the UK. Australia’s archive digitally restored what remains of the film for its centennial anniversary in 2006. 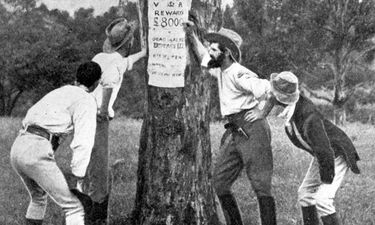 The film was not the first to depict bushrangers or even the first about Ned Kelly, however, it gained enough attention from its success to be banned in parts of Australia and was used as a basis for a ban on future bushranger films in other parts. Additionally, there was at least one instance of the film inspiring real-life crime; a few kids emulated the events by stealing money from a business and later holding a group of children at gunpoint. As the first feature-length film, The Story of the Kelly Gang of course established the practice of longer films. Before this, films generally were 20 minutes long, sometimes less. While today we would consider one hour as short for a film, it was completely unheard of before 1906. 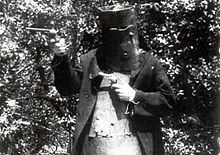 Actor playing Ned Kelly in authentic Kelly gang armor. Another still from the film. Reconstruction of film using what has been found thus far.